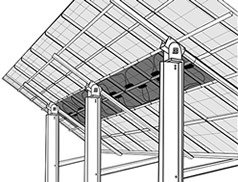 SOLARSCRIM is a simple, economical and functional barrier for electric code compliance of photovoltaic (PV) solar systems. We have two solution options; 1) for utilitarian (under the array), 2) for more aesthetic purposes (perimeter skirts). National Electric Code (NEC) Section 690.31(A) requires the wiring of all systems with voltage greater than 30 volts to not be "readily accessible." 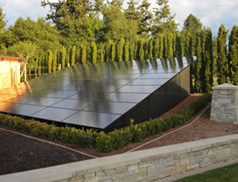 Depending on code interpretation of inspectors in your jurisdiction, SOLARSCRIM addresses this code requirement in a unique and aesthetically pleasing way.